There are two steps to using bsAniPic with your debug output, alter your debug, and configure bsAniPic. bsAniPic requires two markers for each frame, to tell it where the frame's text starts and ends. Here is the POV-Ray code to accomplish this. The first line goes at the beginning, and the second line at the end. Open the configure dialog by pressing 'C' or clicking the gear. The bottom section is current directory specific. 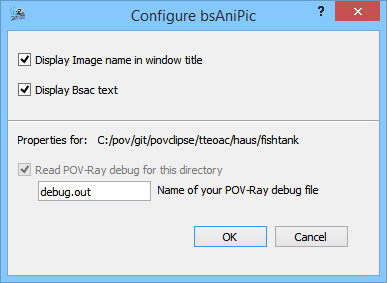 Check the box for "Read POV-Ray debug" and enter the name of your debug file that was output by POV-Ray. The .bsAniPic directory is created in your folder. The debug file name is stored in there. Any debug text that is picked up by bsAniPic is cached in there. As long as there is a frame image, bsAniPic will keep track of the text. Run frames 1 through 10. Refresh the bsAniPic directory to pick up the new frame's texts and images. Refresh the bsAniPic directory and now you have frames 1-20 with all texts. Delete the images for frames 1-15. Refresh the bsAniPic directory and the text for frames 1-15 is lost and now you have frames 16-20.